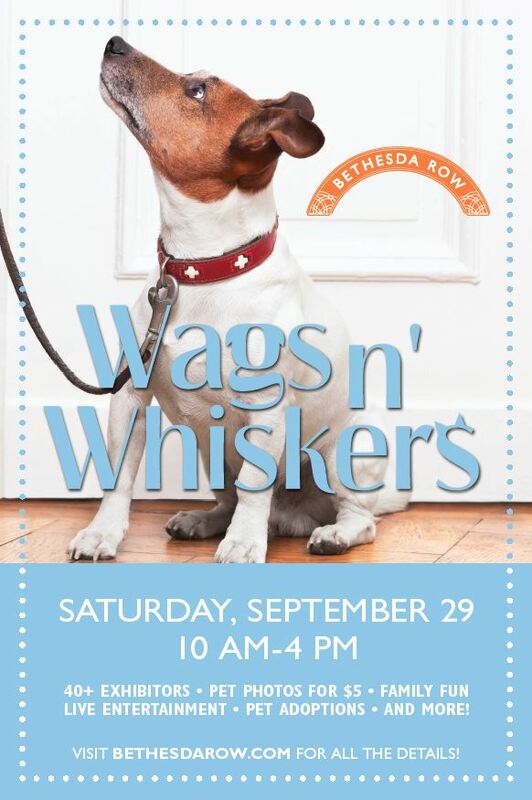 Wags n’ Whiskers, the region’s premier outdoor street festival for animal lovers and their pets, is making its way to the heart of Bethesda, Maryland at Bethesda Row on Saturday, September 29 from 10am to 4pm. Bethesda Row, the DC-area’s top retail and dining destination, will transform Elm Street into a pet-lover’s haven, featuring giveaways, treats, gifts and sales from more than 40 exhibitors, ranging from pet services and accessories to on-site rescues and adoptions. On the heels of the successful Wags n’ Whiskers at the Village at Shirlington, which just held it’s 11th event last month and welcomed nearly 3,500 attendees, Wags n’ Whiskers will be making its debut in Montgomery County at Bethesda Row this year, bringing together some of the area’s best vendors and amenities. Pet parents will be able to shop the latest trends in animal accessories, necessities and toys, and can seek practical advice from area veterinarians and dog trainers. Additionally, children can enjoy face painting and balloon twisting. Live music by Taylor Carson and the Dan Haas Trio will set the mood for an afternoon filled with fun, furry festivities. Attendees can dine with their felines al fresco at participating restaurants or let pups lap up water from water stations while enjoying the specials at participating retailers throughout Bethesda Row, includingSassanova who will be hosting a dog-friendly “Yappy Hour” from 3pm to 5pm. In addition, attendees can enter the day’s raffle for a chance to win dining cards to some of the area’s top restaurants, like Mon Ami Gabi at Bethesda Row and Stella Barra Pizzeria at Pike & Rose. Be sure to stop by the Artful Paws Photography booth to see my latest products and to enter for your chance to win a free studio session and print! This entry was posted in Latest News, Upcoming Events and tagged Artful Paws Photography, dc-dog-photography, dc-pet-photography, dog photography, dog picture, pet event, pet expo, pet festival, pet photographer, pet-photographer-va, pet-photography-va, petfest, photo with dogs, studio-dog-photography, VA dog photographer, Wags N Whiskers.